Shapland & Petter, Barnstaple. 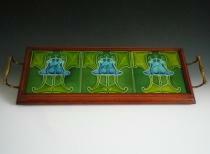 An Art Nouveau mahogany tray, inset with three stylised flowering tiles, with shaped brass handles and brass bun supports. Numbered R1820.